Global Travel Media » Blog Archive » Should Brussels Attacks Impact Your Travel Plans? Rick Steves Says No. Following Tuesday’s attacks on Brussels, the US State Department issued a travel alert for Americans regarding “potential risks of travel to and throughout Europe.” Does this mean we should stay home? Isolated terrorist events — 2004 in Madrid, 2005 in London, 2012 in Boston, 2015 in Paris — are as tragic as they are impossible to predict. With this alert, the State Department is simply confirming something we already knew: Going forward, it’s possible that there will be more terrorist events in Europe (just as it’s possible here in the United States). Also, at frightening moments like this one, keep in mind that there’s an important difference between fear and risk. As the State Department recommends, while you’re traveling, be vigilant. Be aware. Exercise caution. But at the same time, don’t be terrorized. That’s exactly the response the terrorists are hoping for. Our thoughts and prayers go out to the people of Brussels, the victims, and their loved ones. As for me, I’m flying to Lisbon in ten days. And later this summer, I’m booked to fly out of the same Brussels airport that today is a shrine of grief and tragic bloodshed. Am I allowing myself to be terrorized by the terrorists? Hell no. It all comes back to my firmly held belief that the best way for Americans to fight terrorism is to keep on traveling. 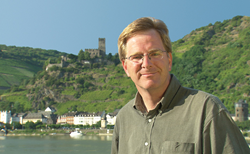 Guidebook author and travel TV host Rick Steves is America’s most respected authority on European travel. In 1976, he started his business, Rick Steves’ Europe, which has grown from a one-man operation to a company with a staff of 100 full-time, well-travelled employees at his headquarters in Washington state. There he produces more than 50 guidebooks on European travel, America’s most popular travel series on public television, a weekly hour-long national public radio show, a weekly syndicated column, and free travel information available through his travel center and ricksteves.com. Rick Steves’ Europe also runs a successful European tour program. Rick Steves lives and works in his hometown of Edmonds, Washington. His office window overlooks his old junior high school.